Breaded chicken covered in marinara and cheese? What's not to like about that? Chicken Parmesan is one of those classic Italian comfort foods that became popular for a reason. It's easy, it's tasty, and relatively inexpensive. Chicken Parmesan is also quick enough for a weeknight meal, but has enough gravitas that it's great for special occasions and even entertaining. One thing I've always been curious about, though, is why call it chicken Parmesan? Sure, it's got Parmesan cheeses in it, but there's far more mozzarella than Parmesan. Naming dishes is a real marketing trick, I suppose. Chicken mozzarella sounds heavy and pedestrian. 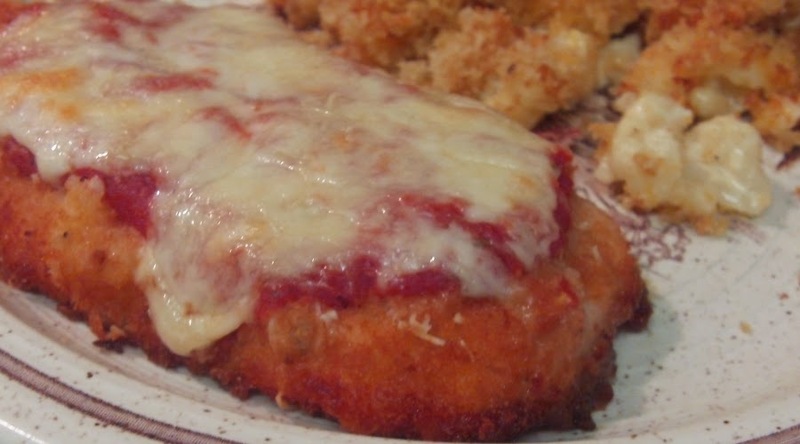 Chicken Parmesan, though, that sounds light and rich, not only in taste but in pocket book. That's not the case, though. Done right, this won't break your wallet, or weight down your stomach. There are a few things to keep in mind when cooking chicken Parmesan, or any other fried food, though. The oil has to be hot before you put anything in the pan. If the oil isn't ripping hot, you'll end up with greasy, flabby chicken parm. Yuck. Also, don't crowd your pan. Breaded foods need to breath. The moisture coming off of them needs room to escape or they'll start steaming each other. Soggy, waterlogged coating just doesn't cut it for me. Before we get started, I want to talk about the chicken breast. Commercially packaged chicken breasts often have a little flap of meat attached to the side, and tucked under the breast by the butcher. This is the tenderloin. Great stuff, but it's best to remove it and fry it separately from the breast. It won't get wiped out when you pound the breast flat, that way. Also, what's with all this “pounding out” the chicken breast? Yeah, yeah. I know. One end of the chicken breast is a lot thicker than the other and pounding the breast flat ensures even cooking. I don't know if it's that I'm lazy, I don't like the noise, or what, but I really don't like risking tearing the meat into little shreds before I cook it. This is just a theory, mind you, but it also seems to me that smashing the bejeezus out of the meat is a great way to damage the cell walls and loose moisture. I could be wrong, but I've all but stopped flattening out my chicken breasts, that way. Instead, I carefully cut them in half, horizontally. This leaves me with two, flat pieces of chicken with even surfaces. They're not the same weight, or size, mind you. The top one is just a bit smaller, but it seems to be working out just fine. You can still pound your chicken if you want, but I don't recommend it. One more thing. Chicken breasts have a bit of connective tissue running though them, just down one side. You can see it quite easily if you look for it. The problem with high heat and connective tissues is that it makes it contract and make things tough. There's an easy remedy, though. You can either cut it out, and cook each side separately, or you can take a paring knife and cut two or three tiny slits across it, evenly spaced through the breast. This will minimize the contractions, and make the breast more tender. Now that I've given you the lecture portion of our recipe, it's time to getting cooking that chicken Parmesan. Preheat the oven to 450 degrees, Fahrenheit, with an oven rack in the middle position. Spread the flour in a pie plate or shallow dish. Beat the eggs and pour them into a second shallow dish. Spread the breadcrumbs in a third shallow dish. Set them aside. Trim excess fat from the chicken and make a decision. If you're going to pound your meat, lay each breast between two sheets of plastic wrap and pound it evenly until it's about 1/2-inch thick. If you're going to cut it, follow the directions above. Pat the chicken dry with paper towels and season with a pinch of salt and pepper. Working with one piece of chicken at a time, dredge it through the flour, them dip it into the beaten eggs, coating evenly and letting the excess drip back into the dish, and then into the breadcrumbs, coating evenly. A tong works great for the first parts, but use your fingers to press the crumbs into the chicken, making sure they stick. Lay the prepared chicken on a plate and repeat with the remaining chicken. Heat the oil in a 12-inch nonstick skillet over medium-high heat, just until it starts to smoke. Add two pieces of chicken and cook until golden brown, about 3 minutes per side. Drain the chicken briefly on paper towels and transfer to a rimmed baking sheet. Repeat with the rest of the chicken. Spoon the tomato sauce, or your favorite marinara, over the chicken, dividing it evenly between the pieces. Divide the mozzarella, sprinkling it over the chicken, followed by the Parmesan. Bake the chicken until the cheese is melted and browned, about 7 to 10 minutes.